Successfully Added Trailblazer - Mini Multifunctional DVR to your Shopping Cart. Introducing the Swiss Army Knife of cameras: Trailblazer – Mini Multifunctional DVR, a compact size DVR that combines LED light, laser pointer, camera, and gas detector all in one. Picture this: you are hiking in the great outdoors on a moonless night. There are dangerous animals, toxic gases leaking from the ground, and in a dark night, it’s easy to knock your head into something that gets in the way. But with the Trailblazer, you move with ease and confidence. Use the LED light to light up your way ahead; the laser pointer will help you scare away animals, and a gas detector keeps yourself away from dangerous gases! What’s best, you can use the Trailblazer to record everything at the same time! 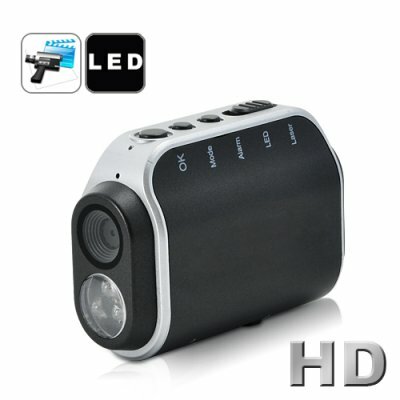 Recording at a 1280 x 960 resolution, this unit will have you easily making movie quality videos in no time. Whether you are a Youtube enthusiast, citizen journalist, or budding cinematographer, this high definition camera will excel your needs! Designed in a compact portable form factor, the Trailblazer can be attached to a lanyard and easily carried around. This will be extremely useful when you are hiking outdoors, hands full with a GPS device and a hiking stick. At a fraction of the price if sold separately, this Mini Multifunctional DVR combines everything you need for an adventurous and fun trip. It also comes with our famous 12 month warranty. It is now available in stock for immediate shipment worldwide. Buy your sample today; it gets delivered within a week. Brought to you by your source of China factory direct electronics, Chinavasion. ON, OFF and record operations are operated by pressing the OK button. Detects high concentrations of CO, CH4, H2, CH3CH2OH.